Posted on 31, August 2016 by EuropaWire PR Editors | This entry was posted in Agriculture, Denmark, Food & Beverage and tagged Arla, Hanne Søndergaard, healthier milk-based alternatives, soft drinks. Bookmark the permalink. A sparkling milk & fruit drink, a milk & tea drink and an energy drink rich in protein are all part of Arla’s new ambition to triple its business outside standard white milk in the global beverage market. Arla wants to challenge soft drinks with healthier milk-based alternatives. Aarhus, Denmark, 31-Aug-2016 — /EuropaWire/ — One important bet in Arla’s ‘Good Growth 2020’ strategy is to capture the opportunities within beverages with a portfolio that includes healthier alternatives based on milk and natural ingredients. The goal towards 2020 is to triple the revenue of milk-based beverages from 230 mEUR in 2015. 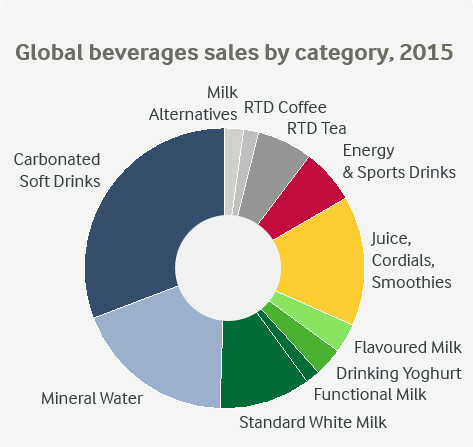 The global market for milk-based beverages is approx. 100 bEUR in annual retail sales value, which is the size of the global standard white milk market. However, it is growing much faster, especially outside Europe. “By addressing the beverage market more strategically, we can double the size of our playing field for liquid milk products and capture significant growth opportunities for Arla. Through branded milk-based beverages we can create more value for our farmers,” says Hanne Søndergaard, executive vice president for global Marketing & Innovation in Arla. Modern urban lifestyle has led to people across the world increasingly snacking and getting their nourishment out of their homes. Mealtimes are blurring, more women are working and more people are living in bigger cities. “We have a big opportunity to provide people with nourishment when they need it, based on the natural goodness of Arla milk. Our milk should not only be enjoyed from litre-sized packages bought in supermarkets, it should also be available as a tasty beverage on the go. We will expand our portfolio to include products that will nourish you, fuel you or refresh you – whenever and wherever you need it. This will create new sales opportunities for us in places such as convenience stores, petrol and train stations, gyms, workplaces, cafes, bars etc., where we are hardly even present today,” says Hanne Søndergaard. Within beverages, Arla has had success through its Cocio® subsidiary and its cooperation with Starbucks®coffee drinks. Recently, beverages such as Arla® Protein and Arla® Move with natural ingredients have been introduced. PRODUCTS & PACKAGING: The current innovation focus includes developing ambient beverages, in which milk, yogurt or whey is the main content. They can be flavoured, carbonated or with added specific benefits such as protein, fibres or grains, etc. However, the team will also have to think beyond dairy, for example by using milk, yogurt or whey as an ingredient in other popular beverages such as sports drinks, water, coffee, tea etc. MARKETS: The 2020 ambition is to be the leading provider of milk-based beverage in Northern Europe and one of the leading European players in Asia, the Middle East and Northern Africa. The UK, UAE and Singapore have been selected as test markets that will receive further dedicated focus to develop a winning model for distribution, sales and marketing that can be rolled out in their respective regions. Arla Foods is an international dairy company owned by 12.700 farmers from Denmark, Sweden, the UK, Germany, Belgium, Luxemburg and the Netherlands. Arla Foods is one of the strongest players in the international dairy arena, with a wide range of dairy products of highest quality. Well-known brands like Lurpak® and Castello® belong to the Arla family. Arla Foods is also the world’s largest manufacturer of organic dairy products.